Editors Note: There are three videos and one photo associated with this Press Release. BMO Bank of Montreal today launched BMO SmartSteps for Parents an online, interactive hub to help parents educate children on money management. The resource is free and available to all Canadians and aligns with recommendations from the Federal Government task force to improve financial literacy in Canada. A BMO survey, conducted by Leger Marketing, reveals only half of parents surveyed (54 per cent) have talked with their children about household finances and 37 per cent are not certain their children have a firm grasp on the basics of money management. "The speed of information and channels are many and dynamic, and the reality is that children are adapting to new ways of learning," said Su McVey, vice president, BMO Bank of Montreal. "Parents, along with financial institutions, share the responsibility of bringing the topic of money management into the everyday family dialogue, but you have to make it fun and engaging. BMO SmartSteps for Parents is designed to address this challenge." Since children develop an understanding of money in different phases as they mature, BMO SmartSteps for Parents is organized by age and stage, allowing parents to tailor activities and lessons. Alison Griffiths, leading financial expert, believes this approach is essential to successfully addressing financial fluency with children. "The earlier you begin teaching children about money, the easier it becomes for them to absorb the lessons as they get older," said Griffiths. "One method is 'show, talk and do' – show them financial transactions from buying groceries to buying clothing; talk to them about making financial decisions, and eventually let them create their own financial world with an allowance, gifts of money and earned money." • Age & Stage Sections: Articles, interactive tools and games address key money issues for separate age groups ranging from ages 5 to 15. • Expert Blogs: Parents can ask questions and voice concerns and receive feedback and solutions from experts, including Griffiths and Schafer and other parents. • The Zone: Kids, tweens and teens can tap into age-appropriate activities including online games that help younger children to recognize money and older children to identify "needs" versus "wants". • Web Series: Parents discuss how they are teaching savings, spending and budgeting to their children. In addition, BMO experts provide real life tips and advice that can easily be applied at home. According to parenting expert and psychotherapist Alyson Schafer, parents believe the onus is on them to instil responsible money management skills in their children, but underscores the importance of augmenting these lessons with outside tools and advice. "Within the family dynamic, life lessons are often passed down from generation to generation, and money management skills are no exception," said Schafer. "Almost all parents feel the burden of responsibility for teaching their kids about money, but often wonder how to actually go about it properly. I am pleased to be a part of the BMO team that will work along side parents, answer their questions, provide lesson plans and tools to ensure they are on the right path from beginning to end." As part of the program's launch, customers who open a BMO Youth Discounted Banking Plan and deposit $25 will receive another $25 from BMO to put towards their child's savings. BMO SmartSteps for Parents is part of BMO's ongoing commitment to Making Money Make Sense. Since 2009, BMO has introduced various tools to help Canadians stay on top of their personal finances, including BMO SmartSteps, BMO SmartSteps for Business, BMO SmartSteps for Students, BMO SmartSteps for Investing and BMO MoneyLogic. The Leger Marketing survey was conducted from Feb. 2 – 10, polling 1,044 Canadian parents 18 years of age or older with children between the ages of five and 15. It has a margin of error of +/-3.1% 18 times out of 20. 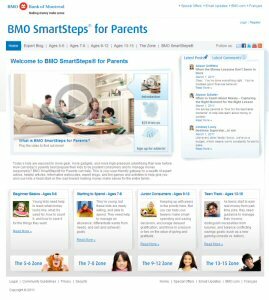 To learn more about BMO SmartSteps for Parents, visit www.bmo.com/smartparents. To view the first video associated with this press release, please visit the following link: http://www.youtube.com/watch?v=-sfoL2dZ3AA. To view the second video associated with this press release, please visit the following link: http://www.youtube.com/watch?v=qVBbrZlLpXk. To view the third video associated with this press release, please visit the following link: http://www.youtube.com/watch?v=-kv6C72kStI. To view the photo associated with this press release, please visit the following link: http://www.marketwire.com/library/20110301-bmosmartstepsengpx800.jpg. BMO launches new SmartSteps for Parents - an online, interactive community for the whole family that guides parents in educating their children about money management. The free, comprehensive resource is available to all Canadians and includes a suite of tools, interactive games and access to leading experts in the fields of finance and parenting. BMO SmartSteps for Parents provides access to leading industry experts including Financial Guru, Alison Griffiths, who offers parents fun and practical tips on teaching children the value of money and how to put those financial lessons into practice. BMO SmartSteps for Parents provides access to industry leaders including Parenting Expert, Alyson Schafer who helps bring clarity to the real-life issues facing Canadian families and provides tips and advice on how parents can address those concerns with their kids. BMO helps parents teach their children the value of a dollar with the launch of BMO SmartSteps for Parents. The free, online community hub includes a suite of tools for the whole family with advice, interactive games, tips, and access to leading industry experts.